"This performance was notable first of all for exceptional care in preparation from first to last, as evidenced by finely balanced chordings, a consistency of rhythmic style and superb clarity of all voices, even in the thickest textures of the fugue. The performance was never in doubt as to what it wanted to be, but it also managed to sound spontaneous. Some details were especially memorable – Mr. Zerweck’s snappy rhythms in the second movement (presto); the supple, earnest phrasing in the tender fifth movement (cavatina); the ferocious start of the fugue. " "Matthew Zerweck (first violin) and Kenneth Freudigman (cello) favored the take-no-prisoners approach, though without compromising tonal beauty..."
"...Mr. Zerweck’s magnificent portamenti on strategic notes were by themselves worth the price of admission. " "Haydn’s “Fifths” Quartet (Op. 76, No. 2) and the third of Beethoven’s middle-period “Razumovsky” Quartets were familiar territory, but the view was made fresh by first violin Matthew Zerweck’s consistently trenchant phrasing — musical, of course, but also rhetorical, as though he were an actor speaking great texts, naturally and without evident cunning. Never before have I heard the first-violin part in a Haydn quartet played with such throughgoing specificity of meaning." "Once again violinist Matthew Zerweck showed remarkable intensity and, in his opening solo in the Ginastera third movement, poised eloquence." "Mr. Zerweck, first violin in the Szymanowski and only violin in the Penderecki, once again proved himself to be a musician of the first rank — secure, intelligent, vital. Friends, seize every opportunity to hear this fellow play while you still can; there’s no way he’ll not have a globe-hopping career if he wants it"
of the greatest chamber-music performances in my experience." surpassed his usual high standard of assertiveness, accuracy and rhythmic acuity. This wasn’t just remarkably able musicianship; it was unrestrained, compelling magic. " "[Zerweck] proved once again to be one of San Antonio’s brightest young talents, a musician great verve, intensity and depth." "The performance was equal to an international standard all around. Mr. Garza’s brilliance and Mr. Zerweck’s muscular playing were especially winning." . An interview before my solo debut in San Antonio. 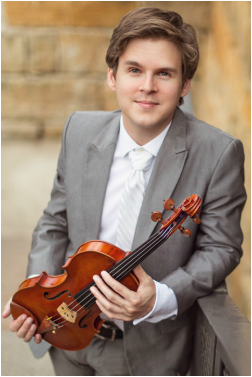 "This afternoon violinist Matthew Zerweck demonstrated a side of his musical personality that I did not know about until today. Certainly not a side you’ll hear often at the San Antonio Symphony." "The performance, by violinist Matthew Zerweck and violist Lauren Magnus, was polished, taut and energetic. Both players were fully engaged with the music, with each other and with the audience. " highest register in the mournful “Canto de Velorio” movement) and Sayaka Okada, violist Emily Freudigman and cellist Kenneth Freudigman." (one of the brightest gems on the San Antonio Symphony’s roster) and [Warren] Jones."